Melissa is currently back in NYC after a successful run of Cabaret at Hillbarn Theatre! ​"Overall, Ms. WolfKlain has captured her own, unique portrayal of Sally Bowles—one worth the price of the ticket to see." Originally from the San Francisco Bay Area, Melissa WolfKlain is an actor/singer/dancer currently residing in New York City. Melissa recently starred as Sally Bowles in Cabaret​, Emily Arden in State Fair​, Fanny Brice in Funny Girl and Josefine/Monica in Romance/Romance. Melissa played Jan in Sacramento Music Circus' production of Grease and also starred in I Love You, You're Perfect, Now Change and Forbidden Broadway at the Cosmopolitan Cabaret (Sacramento), playing such roles as Carol Channing, Sarah Brightman, Ethel Merman and Chita Rivera, among others. Melissa originated the role of Aileen Garrett in the world premiere musical Tinyard Hill at TheatreWorks in the Bay Area. She also was the first to create the roles of Andy in the new musical Toy Story for Disney and Eurydice in Surf Orpheus at the Getty Villa (Los Angeles). She portrayed Young Josie in the ASCAP/LA Festival of New Musicals production and original cast recording of I Married Wyatt Earp. Melissa has a BFA in Musical Theatre from the University of Arizona. 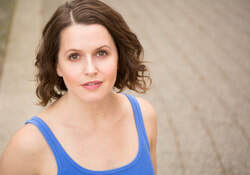 She received the SF Bay Area Theatre Critics’ Award for Kathy Selden in Singin’ in the Rain (Broadway by the Bay), Ginny Award for Liesl in The Sound of Music (AMTSJ), Backstage West Garland Award Honorable Mention for Peggy Sawyer in 42nd Street (FCLO) and a McMurtrie Award Nomination for Little Red in Into the Woods (Arizona Rep). Melissa played Claire in the Lifetime Television movie “The Truth About Jane” starring Ellen Muth and Stockard Channing and has appeared on "America's Most Wanted" and many independent films. She is proficient in many genres of dance including tap, jazz, lyrical, and Fosse and sings many different styles from legit musical theatre to country to pop. Melissa is a proud member of Actor's Equity Association and SAG/AFTRA.